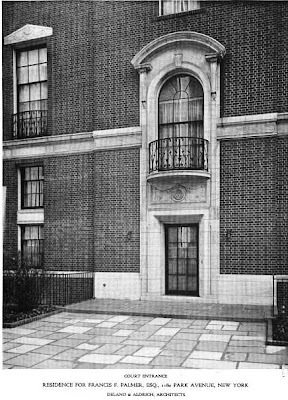 The 1918 Francis Palmer House -- No. 75 E. 93rd St.
On the northwest corner of 93rd Street and Park Avenue in 1911 stood the elegant wood-and-stone country house of General Winfield Scott. Its gardens long ago swallowed up by development, it was now use by the Ursuline nuns as an academy for young Catholic girls. Minturn did construct his own mansion on the eastern end of the property along 93rd Street; however his mother’s home did not materialize. Instead Minturn sold the corner lot to wealthy banker Francis F. Palmer in April 1916. Palmer commissioned architectural firm Delano & Aldrich to design his new mansion. By now the Colonial Revival movement had firmly taken root in America and for the Palmer house, the architects turned to the country’s architectural beginnings. Completed in 1918 the mansion opened on to 93rd Street, despite its 1180 Park Avenue address. The red brick home was trimmed in white marble and recalled the lofty Georgian residences of colonial America. A steep mansard level, covered in slate and punctured by formal dormers, sat behind a marble balustrade. Dramatic slabs of chimneys more than a story tall thrust through the roof. Palmer created what even in 1918 was an extravagant luxury—a huge side court that served as a formal garden behind a tall brick wall. The courtyard entrance was framed in marble extending two stories, creating a Juliette balcony above the doorway. By the time George F. Baker Jr. purchased the house from the Palmer family eight years later, the Park Avenue address had been discarded and No. 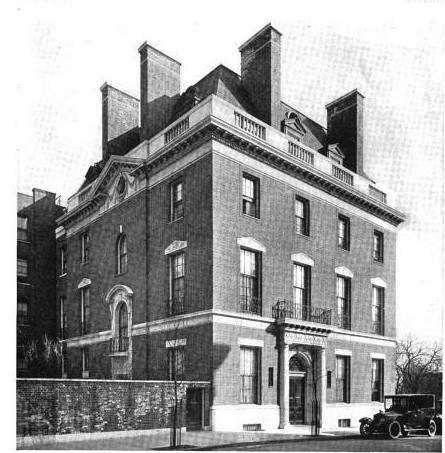 75 East 93rd Street was used.. Baker eyed lustfully the house on the old Minturn property, now owned by William A. Alock. 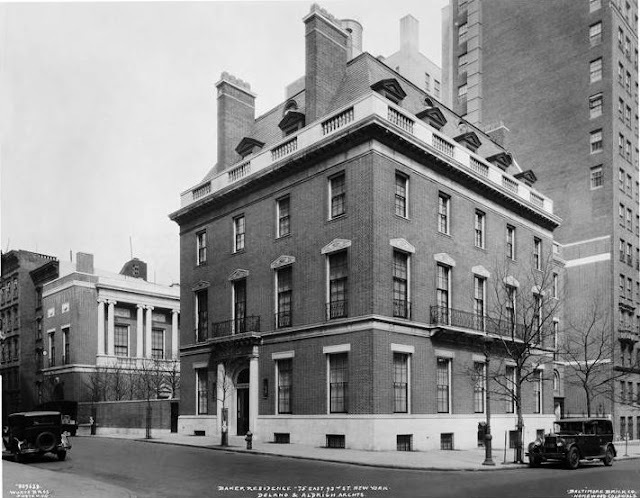 Finally on October 21, 1927 he acquired the five-story Alock house, extending his property to 100 feet along Park Avenue and 139 feet down 93rd Street. The wealthy banker brought Delano & Aldrich back. A year later one of the most impressive residential complexes in Manhattan had been created. In place of the Alock house was a garage with servants quarters above. Joining the new structure with the mansion was a long extension known as the “ballroom wing.” The dexterous use of materials and details made the addition, which now fully embraced the formal garden, nearly seamless. Baker was the son of George F. Baker, for many years the Chairman of the First National Bank. His wife, the former Edith Kane, was the great great granddaughter of Henry Brevoort. Their combined fortunes made the Bakers among the wealthiest couples in the city. The renovations to the mansion were completed just in time for daughter Florence’s coming out. Calhoun sued her cousin for $500,000 for slander. What ensued was a months-long game of tag with the wealthy socialite staying two steps ahead of the process servers. Edith Baker was not at the 93rd Street house when the server first came. It was, after all, August and she was summering in the Baker country estate on Peacock Lane, Locust Valley, Long Island. When he attempted to find Mrs. Baker there, “admittance had been refused him at Locust Valley,” said the press. Back at the 93rd Street house, the butler told the process server to serve the papers on Mr. Baker. Mrs. Calhoun’s lawyers then sent a letter to Edith asking her to “arrange to accept the service.” She responded by leaving a message for her cousin to call her. One might assume the subsequent conversation was less than pleasant. The ballroom wing was the scene of one of New York society’s most important weddings on May 3, 1934 when Edith Brevoort Baker, the Baker’s younger daughter, married John Mortimer Schiff. “The marriage united two members of families long prominent in the philanthropic and financial worlds,” noted The Times. George Baker died in 1937 while cruising near the Hawaiian Island. 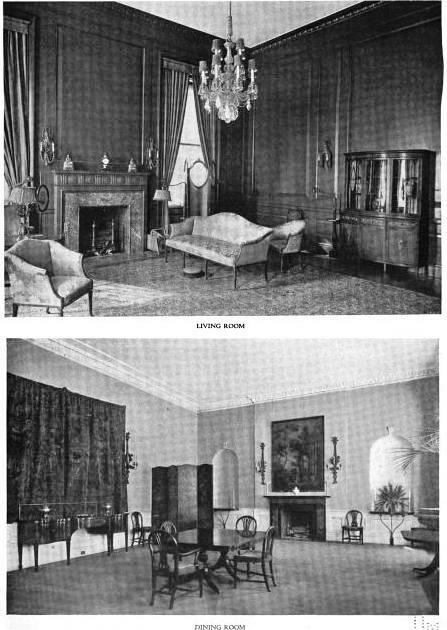 Edith Baker continued to live on in the house; however around the time of the Second World War, she closed off the main house and ballroom wing. She had the servants’ and chauffeur’s quarters above the garage renovated as her Manhattan pied-a-terre and spent most of her time at the Long Island estate. When the White House was being restored during the Truman administration, Edith donated the two antique chandeliers from the ballroom—each containing about 80 carved crystal prisms. Otherwise, the grand home was shuttered and dark and unmolested. In 1958 The Synod of Bishops of the Russian Orthodox Church Outside of Russia approached Edith Baker, offering to buy the mansion as its headquarters. Russian-banker Sergei Semenenko managed to pull together the funds and acquired the house for the church. And as is almost always the case, when religious institutions purchase old houses, changes are necessarily in store. Because the ballroom was to be used as an assembly hall, an outside staircase in the courtyard was installed and French doors replaced the ballroom windows. A large opening was broken through the garden wall and decorative gates were added. The renovations were done with dexterity and sympathy, making the alterations harmonious with the original design. The handsome complex remains one of the most impressive and unusual of Manhattan residential structures. On the first day of July in 1885 Julius Munckwitz resigned his position as Architect of the Department of Public Parks. Born in Leipzig, Germany, he had spent several years working with Parks Commissioner and co-designer of Central Park Frederick Law Olmsted in designing useful and pleasing public parks buildings. Perhaps his salary cut in 1881—from $3,000 to $1,500—contributed to his decision; but he now turned his attention to individual commissions, several of them in Greenwich Village. By the last decade of the century the neighborhood from the Hudson River to Hudson Street was almost entirely industrial. In 1892 Munckwitz was hired by Simon Adler and Henry S. Herrman to design an expansive stables building at Nos. 704 and 706 Greenwich Street. The men had been partners in an insurance company, Adler & Herrman, since 1887, but they were familiar with speculative real estate development. The highly-active Herrman was not only President of the Union Exchange Bank of New York and a Director of the Montefiore Home for Chronic Invalids, he was a vice-president of the Hudson Realty Company. The resulting four-story building was intended for use by a commercial delivery firm with additional income provided by cheap housing or offices on the upper floors. Completed in 1893, it was an attractive while undeniably utilitarian structure. Munckwitz sat the structure on a base of rough-cut stone trimmed in dressed brownstone. Two massive sets of double carriage doors were separated by long, slender square-headed windows and flanked on either side by arched openings. The upper three brick stories were neatly separated by brownstone bandcourses, and continuous stone lintels—treated differently at each level—ran the width of the structure. Shortly after the building’s completion the Real Estate Record and Builders’ Guide reported that, on December 27, 1893, the stables was sold by “Simon Adler and Henry S. Herrman to Mary J. Edwards,” for $60,000. A wealthy widow, Mary Edwards was a member of the Colonial Dames of America and held real estate throughout the city. Her first commercial tenant here was the Baker Transfer Co., owned by Jessie F. Baker. The delivery firm operated here for five years before falling into financial problems. In 1901 the Crosby Transfer Co. moved its operation into the building. The rough neighborhood caused the company headaches in the form of horse thieves. The latest incident involved a shipment of decorative Asian household goods headed for Vantine & Co. on Broadway. “In this case horse, truck, and goods were stolen, and our hope is that the goods on the truck—two cases of Japanese umbrellas and bamboo porch shades belonging to Vantine & Co.—were sufficient to appease the thieves, and that they turned the horse and truck adrift,” he said. The bold thefts were taking place in broad daylight at the crowded Hudson River piers. “The business is so heavy at these points that frequently the drivers have to leave their teams outside and walk up the piers to get their consignments rather than wait in line, tiring out their horse and themselves by long stretches of inactivity,” explained The Times. When the driver would return, his entire rig was often missing. The elevated train of the Manhattan Railway Company had been running up Greenwich Street since 1891; and the noisy overhead contraptions and the skittish horses below were not always a happy mix. On the night of March 22, 1909 little 8-year old Nora Dacey and her 3-year old brother were standing on the sidewalk near the corner of West 10th and Greenwich Streets when a train passed overhead. The children lived nearby at No. 273 West 10th. Down the block at Crosby Transfer a horse which was standing harnessed to a truck was spooked by the train. The frightened steed galloped down the sidewalk towards the children with the heavy truck in tow. A neighbor, Minnie Kelly of No. 169 Perry Street, saw the impending catastrophe and snatched the little boy just as the runaway horse approached. Although she tried to grab Nora, the horse knocked the girl to the ground and the heavy truck wheel ran over her ankle, crushing it. Policeman Gallagher from the Charles Street Station managed to stop the out-of-control horse a block away. The boy and girl were treated at St. Vincent’s Hospital and sent home; but Nora was taken back later that night suffering from shock. 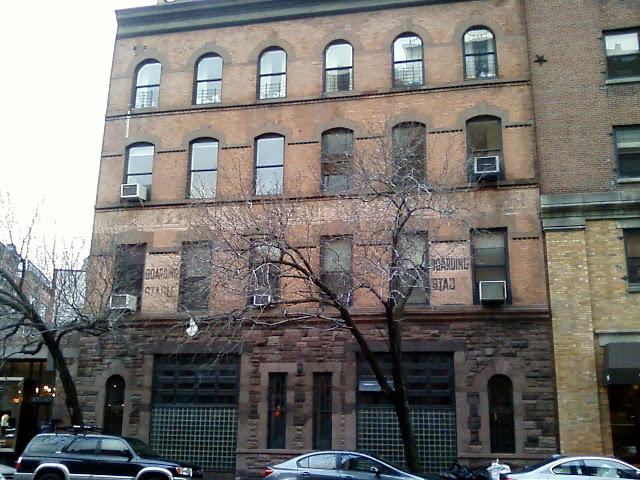 The following year Crosby Transfer left the Greenwich Street building and on March 12, 1910 The New York Times reported that it had been leased. David Walsh, Inc., operated by brothers David and James Walsh took the space. Another trucking company, it ran successfully from the building for years—so successfully that in 1918 Laura Jay Edwards, Mary’s daughter, sold the building to David Walsh. In 1921 Walsh bought an additional property at No. 271 West 10th Street and moved its operations there. By now automobiles outnumbered horses but the noble steeds were not entirely gone. John Ochse was leasing the building in 1926 when Department of Buildings records recorded a conversion to “stable.” After three decades of commercial trucking use, it was now a boarding stables for private horses. It was no doubt at this time that the black-lettered “Boarding Stable” signs were painted on the brick façade. David Walsh died in the 1960s and his brother died by 1976. In 1978 the building was sold by the Walsh estate and two years later was converted into apartments. The wide carriage doors were filled in with glass blocks; the only major alteration to Julius Munckwitz's handsome facade. And, amazingly, the Boarding Stable signs still survive at the second floor—a reminder of a time when horses (and horse thieves) populated the Greenwich Street neighborhood. The 1908 Parkview -- No. 45 E. 66th St. In the first years of the 20th century apartment living for the wealthy had attained acceptability. Lavish apartments, as large as private homes in square footage, provided luxury, panache, and modern amenities. Upper Broadway welcomed the trend with elaborate apartment buildings and residence hotels like the 1903 Hotel Belleclaire at 77th Street, the hulking Chatsworth Apartments completed the same year at the corner of 72nd Street, and the ebullient 1904 Ansonia Apartments at 73rd. Charles F. Rogers got into the act with plans for another grand apartment building across Central Park on Madison Avenue. Rogers was the son of sculptor John S. Rogers who was responsible for filling middle-class Victorian parlors country-wide with affordable and popular plaster groupings—Civil War soldiers returning home, a boy mourning his dead dog, lovers wooing, for instance. They were the 19th century equivalents of Norman Rockwell prints executed in plaster. Rogers apparently approved of the departure, for he commissioned Herbert Spencer Harde and Richard Thomas Short to design the Park View Apartments. Completed in 1908, the $1 million structure was reminiscent of the Red House in its decoration; taking it to the edge without stepping over. As with the Red House, Harde & Short draped intricate Gothic screens like rows of lace around the building and used multi-paned windows to capture the historic period. The façade of the Park View was as much glass as it was masonry—a remarkable feat in 1908. 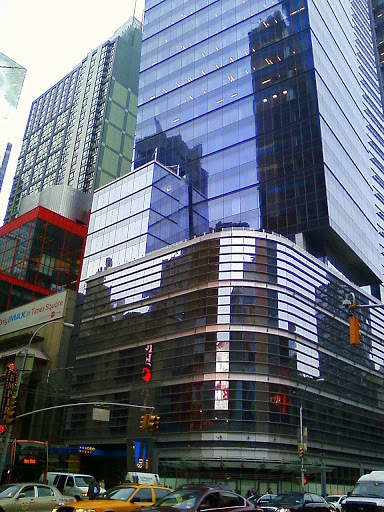 The prominent rounded corner served as the entrance to the building, which quickly dropped the name Park View in favor of the address—777 Madison Avenue. There were just two apartments per floor, with either 12 or 14 rooms, and the building quickly filled with important business and society names. Among the first residents were Henry W. Poor and his wife, the former Constance E. Brandon. Poor was a publisher and financier; the President of Poor’s Manual of Railroads, Publishers; a Director of the Postal Telegraph-Cable Company of Texas; the Missouri, Kansas & Texas Railway Company; and the United States Casualty Company. Herman Behr was an early resident. He and his wife moved in with their unmarried son, Karl. Although Karl was an attorney with an office at No. 40 Wall Street, he was best known as one of the foremost tennis players in the country and had been a member of one of the Davis Cup teams. Both of Herman Behr’s sons had made names for themselves in sports. Karl’s married brother, Max, who lived in Morristown, New Jersey, was a well-known golfer. In November 1911, young Karl sailed off to Europe “on a pleasure trip,” according to the Newark Evening News. Six weeks later the wealthy athlete headed home, boarding the new R. M. S. Titanic in Southampton, England. 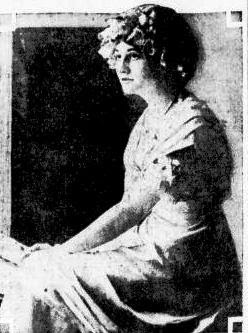 In 1914 Florman turned his attention to the 19-year old heiress Olga V. Kohler. Olga’s father, Charles Kohler, was a wealthy piano manufacturer and owner of racing stables. He had died leaving his three teen-aged daughters and widow a fortune of more than $4 million. Olga received a $25,000 per year income (nearly half a million today). Her father’s will provided another $100,000 to be paid when she reached 25, 35 and 45 years of age. Olga fell for the smooth-talking Swede and on April 5, 1914 the couple was married in St. Patrick’s Cathedral. The Washington Herald reported that the marriage “amazed society.” The pampered and entitled teenaged bride sailed off to Europe for the honeymoon. Unfortunately, war broke out while they were touring Wiesbaden, Germany, and the newlyweds were trapped for a time. “When the Flormans did get away it was without baggage valued at $3,000,” said the New-York Tribune. The teen-aged Olga had trouble budgeting. Upon their return to New York she took an apartment at No. 777 Madison Avenue, paying $5,000 a year rent. She then spent $20,000 to furnish the apartment. And she was pregnant. Once the baby arrived, Olga was in a financial pinch. Olga pointed out to the court that her son, born on January 18 was a “large item of expense.” The Tribune report dripped with sarcasm. “His advent required the engagement of a trained nurse and an ordinary nurse to wheel the perambulator and shake rattles before his scowling features when he was ill tempered. And to wash and dress the youngster, Mrs. Florman found she could not do without a special maid. When Max Loewenthal purchased No. 777 Madison Avenue on November 12, 1921, the New-York Tribune called it “one of the finest on the East Side” and mentioned among its tenants “Mrs. Jane L. Armour, Goelet Gallapin, Harrison Williams, Leonard M. Thomas and Walcot C. Lane.” Also in the building was eminent astronomer Joel Browne Post and his family. That year Constance E. Poor died and her apartment was taken by Stephen H. P. Pell and his family. The arrival of the Pells would begin a succession of high-profile events. Mrs. Pell was highly involved in human rights causes and hosted meetings of the National Woman’s Party here. She was the group’s National Finance Committee and traveled to Washington to “call on President Coolidge on Feb. 15, the birthday of Susan B. Anthony, to ask his support of the equal rights amendment,” according to The New York Times on January 23, 1927. Stephen Pell had served in both the Spanish American War, receiving the Sampson and Spanish War medals; and in the First World War in which he was severely wounded, earning him the Croix de Guerre from the French Government. Two weeks before his wife announced her upcoming trip to see the President, the French Government conveyed another tribute on Pell. Fort Ticonderoga, built by the French military in 1755 and crucial in the French and Indian War, stood on Pell property. Stephen Pell commissioned architect Alfred C. Bossom to head a restoration of the fort and he established a museum on the property. The French conferred the Legion of Honor on him for his work on the fort on January 5, 1927. Only when the newspapers hit the streets the following morning could Mrs. Williams bask in the attention. Carlisle J. Gleason and his family were living here in 1926. It was a notable year for the Gleasons for several reasons. Daughter Louis was married in East Hampton, Long Island in July to the dashing Lieutenant Frederic Stanton Withington, Jr., of the Navy in a small stone church. The reception was held in the Gleason summer estate, Greyshingles. Later that year Gleason employed Terence Stuart to clean the many windows of the Madison Avenue apartment. The 28-year old specialized in high-end residences and also cleaned the windows of Mrs. Mary Crimmins at No. 157 East 63rd Street. Stuart turned out to be as good at cleaning out jewelry chests as he was cleaning windows. Unknown to the millionaires, a teen-aged Stuart had been convicted and sentenced to serve from five to ten years for his part in a hold-up in 1919. “He escaped a year later from Clinton Prison, was recaptured and sent back, but was released on parole” in 1925, reported The Times. After he left, Mrs. Crimmins found she was missing $25,000 worth of jewelry, including a pearl necklace worth $3,000. Carlisle Gleason had lost $20,000 in jewelry. Stuart found himself going back to prison, now, with a new ten-year sentence. 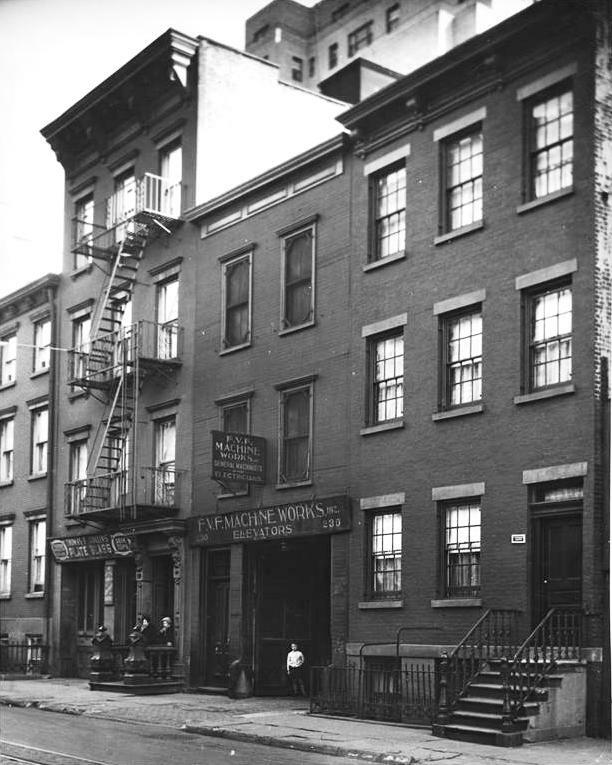 On February 22, 1928 Jane Livingston Armour died of pneumonia in her apartment here. The wealthy widow of Herman Ossian Armour of the Chicago packing firm Armour & Co. was 83 years old. Her passing was symbolic of the end of an era in the Parkview apartments. By now retail stores along Madison Avenue were commanding high rents. That year the building owners commissioned Thomas & Churchill to alter the street level, moving the entrance to No. 45 East 66th Street. The sidewalk level was now converted into store space. Surprisingly it was not the Great Depression, but World War II that signaled the end to the grand, expansive apartments. The restrictions of the rent control laws that came into effect during the war could be circumvented only by subdividing the apartments. From 1948 to 1953 vacated apartments were dissected, becoming two. The building was modernized by removal of most of the lacy terra cotta screens of the 6th and 10th floors. Two decades later the building was threatened when owners Bing & Bing sold the venerable apartment house to Sigmund Sommer in 1973. 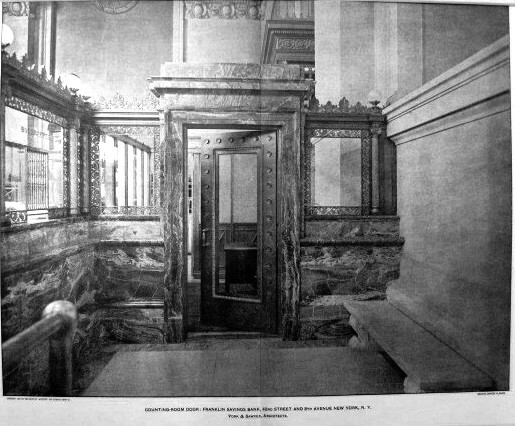 Sommer’s idea of improvements included the installation of fluorescent tubes in the hallways and firing the elevator operator in favor of automatic controls. The residents revolted. Rent strikes and demonstrations resulted in Bing & Bing reacquiring the building in 1977, the same year it was designated a New York City landmark. A decade later No. 777 Broadway was converted to cooperative apartments. Vincent Stramandinoli was commissioned to head a restoration of the façade, including replacement of the lost terra cotta elements. Harde & Short's wonderful turn-of-the-century structure, considered by some their masterpiece, emerged from the restoration a fantastic relic of early 20th century luxury living. The 1833 Blauvelt House -- No. 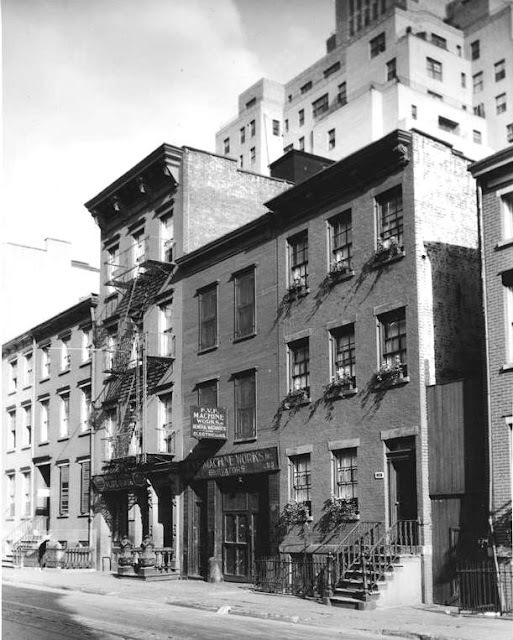 232 W. 10th St.
By 1833 the population and building boom in Greenwich Village was going strong. John C. Blauvelt was earning a living as a cartman, but he had greater aspirations. That year he not only applied to the Board of Aldermen “to be appointed a Wood Inspector” according to board minutes; but he built a brick home at No. 232 West 10th Street. Blauvelt’s brick house was typical of the Federal-style homes being built at the time. Two and a half stories tall, it sat above an English basement below street level. Plain brownstone lintels and sills and an unadorned door frame reflected the owner’s financial status—comfortable enough to build a brick home; but without unnecessary embellishments. The pitched roof would have been punctured by one or two neat dormers. It appears that Blauvelt’s application to be Wood Inspector was denied, for a year later he sold the new house to John Kohler along with the empty lot next door at No. 230. John Blauvelt moved on and his name appears soon after as a resident of Rockland County. Construction continued along the block and in 1848 Richar Dongan built a Greek Revival style home next door at No. 234. A narrow horse walk separated the houses, which lead to a one-story wooden stable in the rear. On the empty lot that Kohler purchased with No. 230 a brick-fronted stable was erected. Around the time that the Civil War drew to a close, a full third story was added to No. 232. An up-to-date Italianate cornice with handsome scrolled brackets and new iron railings and newels for the stoop completed the makeover. William G. Warren, whose father was a policeman in the Steamboat Squad, was living here in 1889. The 21-year old ran into trouble on his way home on May 18 that year as he was walking along Bleecker Street, near West 10th. Suddenly, apparently without provocation, he was struck on the shoulder by James G. Anderson. The Victorian term “plunge” translates into the modern equivalent of a swimming pool. Unknown the Warren, the water had been drained to only a foot deep. He leaped over the railing and dived into the pool head first. “His head struck the bottom of the plunge with great force and he lay motionless. Two men who were in the room at the time lifted the man from the tank,” said the newspaper. Warren, now 30 years old, suffered a compound fracture of the skull and died in the hospital three hours later without recovering consciousness. By 1908 both the stable and the house were owned by F. Egler who leased both buildings. Within four years No. 232 was owned by Mrs. Mary Peddie who lived here with her 11-year old daughter, Kate, and rented the basement to Mrs. Josephine Brooks. The women had a friendly relationship and when Mrs. Brooks was away, Mrs. Peddie often fed her tenant’s two dogs, Tom and Tony. On April 1, 1912 things went horribly wrong. The priest who had a reputation for combating drunken sailors now set off to battle mad dogs. It was apparently the last straw for Mary Peddie. The following year the house had become the Home of the Sons and Daughters of Israel. Organized four years earlier, its purpose was to “maintain a home for aged male and female Hebrews.” The home limited the number of elderly residents at 70. The Home of the Sons and Daughters of Israel would remain here for decades. By 1931 it was using part of the old stable building next door and its capacity had greatly increased. 150 of the residents enjoyed a day at Edgemere, Long Island on July 28, 1931 in the home’s annual outing. For those who cared to dance, an orchestra was organized among residents. By the middle of the century the Home moved to updated, modern facilities uptown. In 1951 the house was converted to two apartments, one on the first floor and a duplex above. Today the house looks much as it did in the late 19th century. Despite minor alterations like replacement windows it is a charming and intact survivor. The sleepy character of the little Village of Greenwich woke up when throngs of New Yorkers fled the cholera and yellow fever epidemics in the 1820s. Once away from the congested conditions of the city to the south and enjoying the open air of the surrounding countryside, many of the newcomers stayed on. Realizing the opportunity afforded by the burst in population, the brothers, Isaac A., Jonathan and Charles C. Hatfield, purchased land from Richard Amos in 1825. 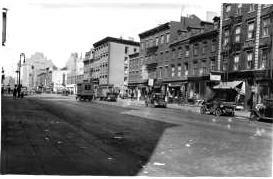 The plots stretched along Hudson Street, between Christopher and Amos (later renamed 10th Street) Streets, and around the corner along Amos. Two years later Isaac, a builder-carpenter, completed construction of a row of five brick-faced homes along Hudson Street. Three and a half stories tall, they were typical of the Federal-style homes that were cropping up in the neighborhood. Prim pedimented dormers punctured the peaked roofs and simple lintels and cornices decorated the facades. Among them was No. 510. Like its neighbors, it was intended for a working-class family financially secure enough to afford the few extra touches like the Flemish bond brickwork. That security slipped away from H. Meyers, apparently. 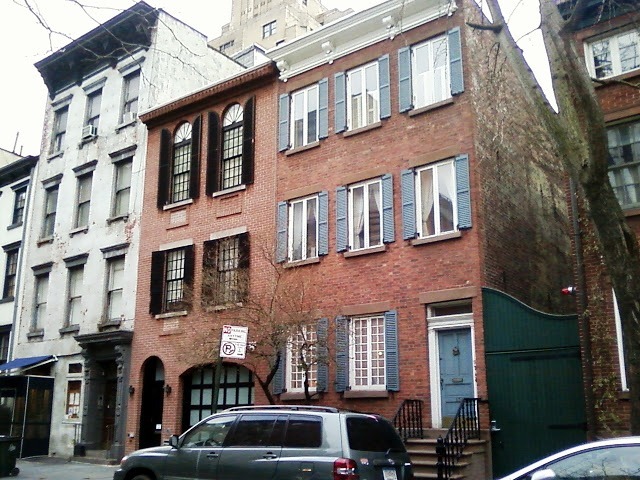 He was living here in 1854 when he suffered the embarrassment of having his name published by New York County for failing to pay $52.88 in back taxes (a little over $1,000 today). 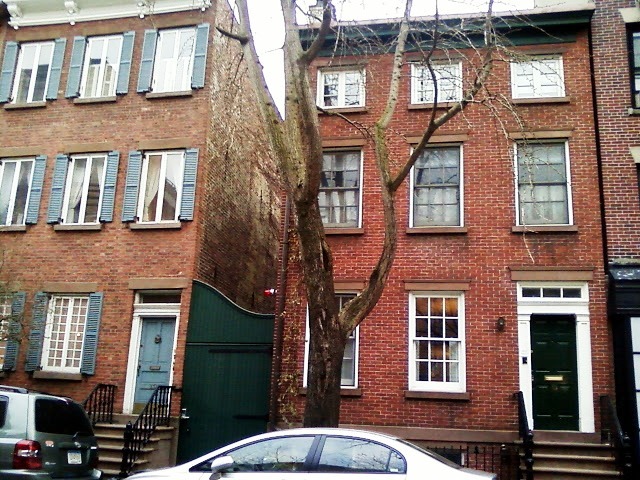 Later, in the early 1860s, Amelia A. Blakely lived here. She was a teacher in the Primary Department of School No. 16 on West 13th Street and would stay on for several years. Her very existence here reflected the still-respectable nature of the neighborhood, while the area nearer the river just a few blocks to the west filled with grittier elements--a brewery, soap plant, and iron works for example. The house was owned by the Groosjean (sometimes spelled Grosejean) Family following the Civil War. It would appear that the ground floor had already been converted to commercial use by 1876, for the Board of Aldermen paid E. Groosjean paid rent on the premises “for general election November 7” that year. Perhaps only the effects of the Great Depression saved the venerable building. But for whatever reason, No. 510 and its nearly identical neighbor at No. 512 survived. But they were in sad condition. Four years later No. 510 was vacant and neglected. 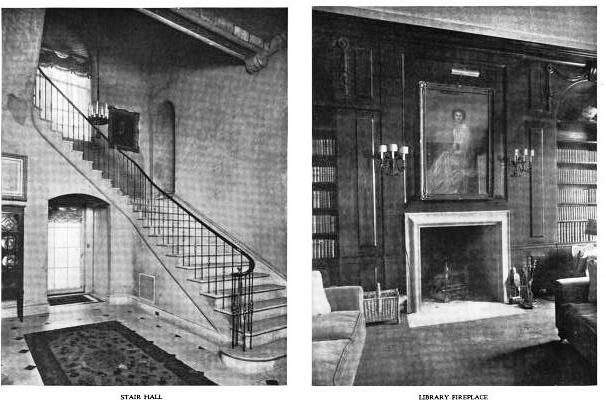 In 1933 architects Scacchetti & Siegel whose offices were at No. 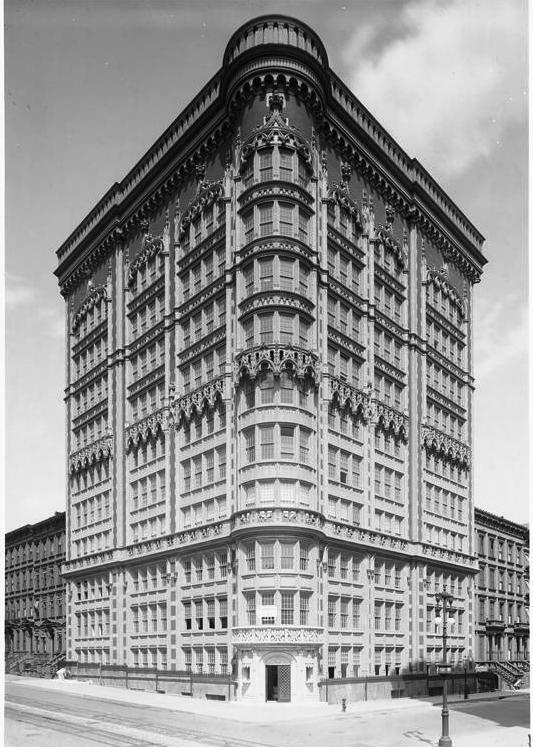 1775 Broadway, were commissioned to convert the decaying building into a “store with apartments above.” The firm was faced with a daunting task. The 1930s was a period not particularly known for its sensitivity in restoration, especially of structures with no connection to historical events. Yet No. 510 Hudson Street was essentially unaltered above street level. No. 510 and its nearly-identical neighbor to the left, No. 512, managed to retain their 19th century charm above street level. Today Employees Only, an “American Nouveau” restaurant serves dishes like duck confit salad , a Serbian charcuterie plate and “serious cocktails” according to New York Magazine. The venerable house has seen much change in its nearly 200 year existence; but has stubbornly resisted that change above street level. 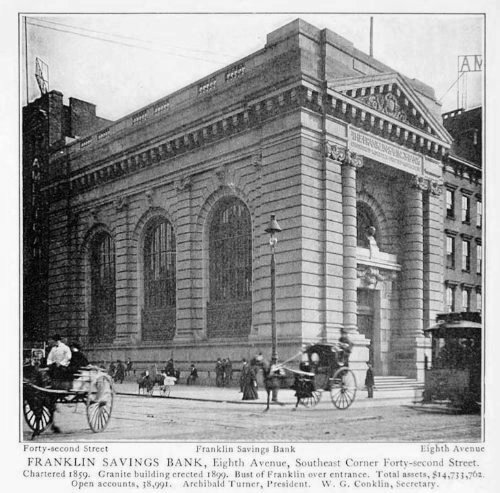 The Franklin Savings Bank was doing well as 1897 drew to a close. The institution boasted a surplus of $912,000 and the devastating depression, known later as the Panic of 1893, had finally abated. To design this new ornament the trustees called upon architects York & Sawyer. With the depression fresh in the minds of depositors, the firm was charged with producing a bank that would instill a sense of permanency and confidence. And they did. The first of many bank buildings York & Sawyer would design, it was nothing if not solid-looking. Constructed of granite it drew its inspiration from the Roman temple. 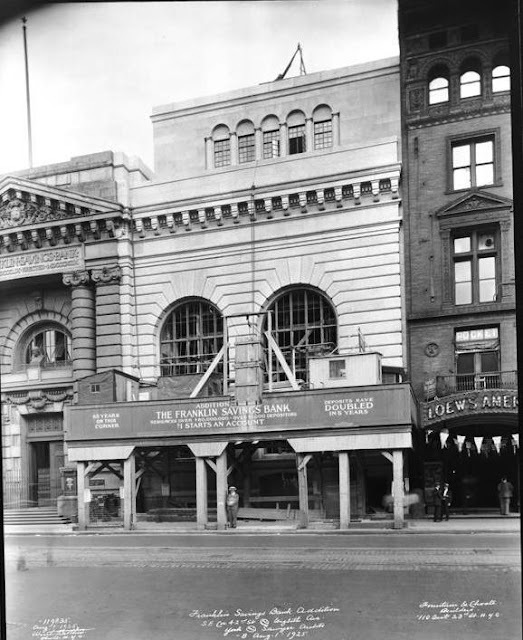 The heavy, rusticated façade was broken by three enormous arched openings on the 42nd Street side. A matching arched window above the massive bronze doors continued the design to the recessed entrance. Two monumental columns upheld the entablature below the cornice that was surmounted by a classical triangular pediment. The new bank, completed in 1901, sat on the southeast corner. Above the magnificent bronze entrance doors which weighed several tons sat a bronze bust of Benjamin Franklin. Inside the architects carried on the classical theme. 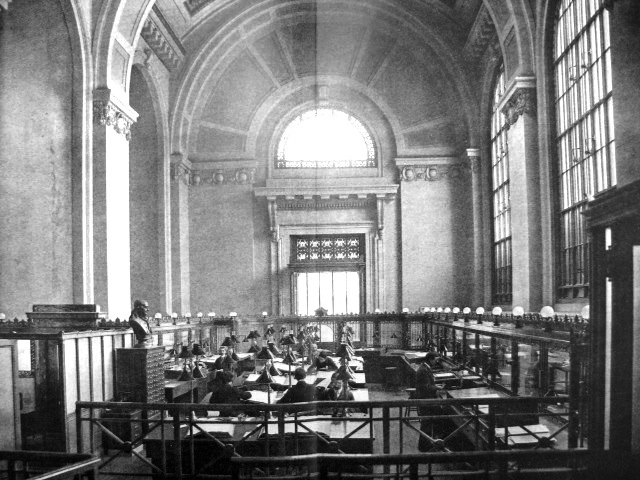 Roman-inspired railings (quite similar to those that would be found in McKim, Mead and White’s monumental Roman-style Pennsylvania Station a few years later); soaring arched ceilings; and a host of materials—Caen stone, colored marbles, bronze and brass—created one of the city’s grand internal spaces. The somber bank building brought little attention to itself, other than merely by its own colossal appearance, over the decades. Rare publicity did come in the form of a corrupt police officer in 1912, however. 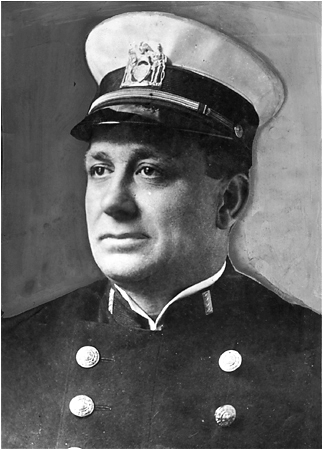 Lieutenant Charles Becker was the head of the NYPD’s Vice Squad. He augmented his salary by accepting hefty bribes from illegal gambling clubs. When the owner of a Broadway gambling house, gangster Herman Rosenthal, known as “the Black Ace,” got in his way, Becker had him murdered. The sensational trial made front-page headlines for months and introduced readers to colorful witnesses like Lillian Rosenberg, called by The Evening World “the ‘baby-doll’ wife of Lefty Louie,” and Jack Rose who personally collected Becker’s graft. The corrupt cop chose the Franklin Savings Bank to stash his gains, so the prosecution called bank employee Daniel A. Bentien to the stand to testify about Becker’s unusually large deposits. According to The World on August 14 of that year, he had banked "$38,115 in the last nine months.” That figure would translate to over half a million dollars today—an unusually high income for a civil servant. By 1903 Benjamin Franklin had found his perch. 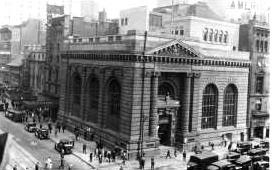 In 1926 the architects were called back to enlarge the bank, continuing the rusticated façade and copying the arched openings southward on 8th Avenue. 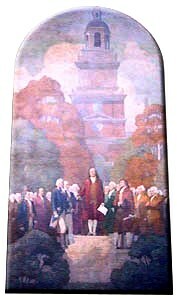 At the same time illustrator N. C. Wyeth was hired to execute a mural of Benjamin Franklin standing before Independence Hall. Half a century later the bank commissioned architects Poor and Swanke and Partners to design a new, up-to-date headquarters across the street. In stark contrast with its classical predecessor it was a modern linear building that accentuated clean lines and angles. The New York Times lashed out at the bank’s directors in an editorial nine days later. “The ‘dump’ has sculptured bronze doors valued at $35,000 and fixtures that will go to the Brooklyn Museum, arched windows, vaulted ceilings and solid cut-stone facades. It also has something increasingly rare in this and other cities: quality of structure and validity of style. 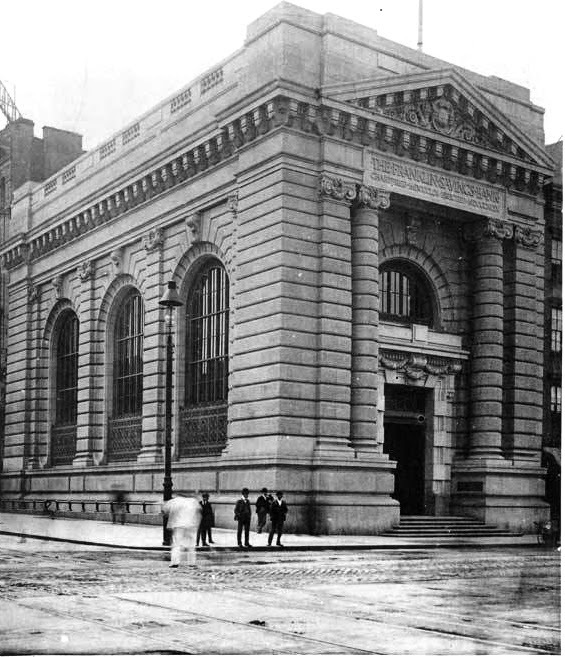 Unmoved by the outrage of newspapers, preservationists and city officials (Richard Lam, director of the city’s Office of Midtown Planning said “I don’t believe the building is an eyesore—I have more serious questions about the advisability of using that site for a parking lot.”), the bank forged ahead with the destruction of its granite Roman temple to finance. The Wyeth mural was saved at the last minute and eventually was donated to the University of Pennsylvania. The bronze bust of Benjamin Franklin was donated to the Brooklyn Museum. Sadly, despite The Times' hopes, the museum could not accept the mammoth bronze doors because of their size and weight. It appears they were sold for scrap metal. The J. J. Van Alen House -- No. 15 East 65th St. The Augustus Whiting House -- No. 137 E. 27th St.